Sticky Password Premium lets you log in and check out of any website, automatically completing logins and forms instantly. We've scanned stickypassword.com using a variety of antivirus software and can bring you the following results. Joe McCormick I tried the trial yesterday. It works like LastPass but it is free and yours is not. I did not see an import feature where you can import passwords from other programs like Roboform and Lastpass. I will stick with Lastpass. S.C. I also tried the the trial and there is an import option for roboform and others and it worked well for me. but the program overall hung too much on my rig. i uninstalled. still none compare to roboform in my opinion. Gray Lox I'm a happy user of Sticky for PC since several years, now I would also like it for the Android tablet. Will there be a BDJ promotion for the extended version too? Sticky Password Team Joe: Sticky Password offers import from other password managers. You can find it in the main user interface window - Menu - Import. S C: I´m not sure when exactly did you have such problems but if you´ll provide us with more details and contact us at support stickypassword.com, we will do our best to help you to run it correctly. Gray: The version offered in this promo is Sticky Password 7 (online) which includes online sync across all devices of a user. It supports Windows, Android and iOS. The applications for Android and iOS are available on our website (http://www.stickypassword.../downloads). But I'm a long time user of LastPass Premium. What advantages do you have over LastPass? Karl M. Can it share login accounts? That's a feature I absolutely need and use. Lisa Griffiths I am a little confused. The description above says it only works in desktop mode in Windows 8 so does that mean it will not sync? Could you please explain this? A question about today's deal. Which of the versions is today's deal: Sticky Password (ONLINE SYNC) or Sticky Password Desktop (OFFLINE)? In the title of today's deal it says: "Sticky Password 7-12 months license v7.0.4.40 for PC". I will then be a little puzzled about it is the "online version" or "offline version". Sticky Password Team Karl: How do you exactly mean please? Do you mean to share it with someone else? Or to use one login details for different accounts? Lisa: No, of course it syncs on Windows 8. That mean that we support only desktop mode (display) on Windows 8 and metro mode is not supported yet. Michael: The version is Sticky Password 7 (online). Officially it´s named only Sticky Password 7 and the license is for 12 months. The offline product is Sticky Password 7 Desktop. _*_ I own SP 6, and have a couple questions. Is there any deal going to be offered for the Sticky Password 7 Desktop version? I am having trouble logging into account which ask the area one wants to view (e.g. credit card account that asks me to select from: Credit Card, Banking, Home Loan, Student Loan, Personal Loan). I simply want to log into the credit card area to see my account. Is there a method for this, as I have accounts like this? Sticky Password Team _*_: The price of an upgrade to Sticky Password 7 Desktop is 17.99 USD. Regarding the autofill, I´m not sure what exactly do you mean, but you can contact us at support stickypassword.com and send us the URL of the problematic website and we will check it. singularity Is this better than lastpass.. They give awesome service for free and cross device service for a very little charge.. I mean the possibility of LastPass to share selected login data (usernames + passwords) with other LastPass users. This is a very important feature for me. Sticky Password Team Chris: I replied the question about LastPass a few posts above. The price of Sticky Password is almost similar as price of LastPass. Feel free to try our product and check how you will like it. Sticky Password Team Karl: It´s possible to send selected account in encrypted file to other users however it´s not possible to share one account with other users in real time. That would need to share some part of the database. Mobile version for Android with unique floating window feature (mobile and later on also tablet support). Mobile version for iOS (iPhone, iPad) - will be ready in a couple of weeks. Improved user interface with new design (redesigned First Run Wizard, Import/Export wizards). And tons of other improvements (for example added import of passwords from Yandex, Comodo Dragon and Seamonkey browsers, ...). I have SP7 online, and my license will expire on Oct. 2014. If I buy the license, could I extend SP7 to Oct 2015? JP Same question as zhxiang xie, I already have SP7 online, would this extend my membership for another year? JP Can the Sticky Password Team let us know whether this will extend our licence for exisitng customers? Sticky Password Team zhxiang, Jason: Yes, Sticky Password 7 online License Key is just a 1 year coupon. If you insert it to your StickyAccount (or application connected to the StickyAccount) which has been already activated with a different License Key, your subscription will be extended by another year. Does the 1-year subscription start from the purchase date or when it gets activated after inserting it in the StickyAccount? Sticky Password Team Stephane: The subscription starts when you insert the License Key to the StickyAccount. Stephane M Sounds good! Thanks. BitBucket What happens when the 12 months is up? You're right. There is no import of passwords from other PW managers. I think that is a big minus for a lot of people who are looking to change to a new PW manager because you have to enter ALL of your passwords again...it's a hassle. Actually I have Sticky PW 6. It's a really good PW manager and I'm satisfied with it. Sometimes there are compatibility problems with the browser and auto-fill extension, but they usually have an update to fix the bugs soon. Overall, I do recommend this PW manager if you don't have one. Whoops! I made a mistake! There IS an import option to import PW from other PW managers. It is found in the top drop down menu. You can import passwords from: Internet Explorer, FireFox, RoboForm, KeePass and LastPass. Maybe more in version 7, I have version 6. Sorry Sticky Password! I do apologize... Again, great PW manager! Peter User @MechaBull: Maybe that Version 6 was good - if it was NO online-version - I don´t know. But now you must create an account and store your PW online - no good idea. I would never recommend this. Yes, I have version 6 that stores the PW locally on the C drive. I would NEVER have my PW stored on cloud...it's crazy! I don't use cloud to store anything private or important. Actually I don't know which version is offered here, but Sticky PW 7 has 2 versions; a cloud and non-cloud(local) version. The non-cloud version is more expensive. Bertie Brummel "The non-cloud version is more expensive." LOL. Perhaps the NSA supports the cloud version? Yes, there´s an import option to import passwords from other PW managers. The offered license is for Sticky Password 7 online. It covers and syncs ALL devices of a user and a 1-year subscription also includes ALL upgrades and new features. Peter User Sticky Password Team: It´s not only the risk that "anyone would be able to get access to your online account". One example: What should I make when your server is offline or something else that I can not login to my account and I need urgently a password? There are so many backgrounds that I say: No, passwords never online. The database of Sticky Password is stored encrypted locally on your computer. Only an encrypted backup of the database is stored and synced to the cloud. So you will be able to get your data even when you won´t have any internet connection. Jeanne Esther I've used and recommended Sticky Password for years, but I'm reluctant to upgrade due to the licensing. Does this mean that I would be stuck if I do not buy a new license within one year? Or can I export the data to my old desktop version and keep using it? I like the fact that there is now an Android version, but do not need the cloud version. Is the one year licensing only for the cloud version? Or does it also apply for the offline desktop version? 1) Sticky Password 7 (online) includes online synchronization for PC/Android/iOS. The license is annual and per user (it covers all your devices). 2) Sticky Password 7 Desktop license doesn´t include synchronization, valid for Sticky Password 7 and it´s per computer. The version offered in this giveaway is Sticky Password 7 (online). After one year, you have to extend the subscription. If you won´t do it, you will loose features of Sticky Password however you will be of course able to export your data or switch to Sticky Password FREE. Peter User Sticky Password Team: How, when I´m example sitting with my netbook in a restaurant (the database is not "up to date") and have no connection to the cloud? _*_ @Sticky Password Team, Will there be a sale on the Desktop version on Bits in the near/medium future? I currently own version 6 and would really like to see a sale on version 7. I am presently using eWallet, but I like to give Sticky Password another go in the new version. Sticky Password Team To Peter User: If you will be in a restaurant without internet connection and you database won´t be up to date, you will have access only to currently stored data in your local database. But that won´t be different with the Desktop offline version where an update is much more complicated. Regarding problem with deleting of the data, it´s not so simple. Such attacker would be able only to delete the backup of the database stored in the cloud. That does not mean that an empty database would be then synced to your installations. You would just loose the online backup files. But you still have the local database and backups and new online backup would be created after next sync. To fulfill the scenario when the empty database is synced, the attacker would have to get access to some of your installations, delete the data from the database and sync an empty database to the cloud. But you can easily restore the data from the latest local backup even in this case. Note that all your data are still stored mainly locally. To charles basner: Sticky Password supports many applications (currently only the 32bit ones). We don´t have any list of all supported apps. It depends on used technology. We try to do our best to support most apps. Just try it with your bank app. If you will have any problems, feel free to contact our customer support, we will test the app and let you know if it´s possible to support it. You have Your "MASTER Password" that Encrypts ALL of your Passwords (and other Information) LOCALLY (on your PC) and your ONLINE ACCOUNT should be set up with a DIFFERENT Password (than your MASTER Password) !!! You MUST have a STRONG Password as your MASTER Password!!! None of those (piddly) 6 to 8 digit passwords !!! Make your MASTER Password at LEAST 15 Characters... include a few (1-4) numerals, both upper and lower case letters and (IF The companie's Login Password field will allow it) use at least 3 to 4 "Special Characters" ($ # @ * ½ ¼ , etc.). All of the above should of COURSE be in RANDOM Order. REMEMBER: This is the ONLY Password that you need to remember! With a "SUPER STRONG" Password like that, any "Super Computer" (with TODAY's Technology) will take over 100 years to break it !!! We don´t plan a sale of the Desktop version in the near future on BitsDuJour. You can try our online version for free from this giveaway offer. Is this Free Version you are talking about, the Free Desktop Version? And does this mean that as a paid customer, I can export that data to my current desktop version which is version 6 or do I have to first upgrade to the desktop version - version 7, so that I can be able to import that data into it? I do understand that you want to offer synchronization for Android/IOS, and therefore license it per year. But please find an easier solution. I don't really like the idea of forcing me to take a license so that I can be able to use my data on other devices. There are many online backup services, and I would like to be able to do that myself when necessary. It would be good to simply allow us (old customers) to easily switch between the Desktop and an Android or IOS version. As a customer and long time user of Sticky Password, I am quite disappointed. I'm not really encouraged to upgrade and hope you can find a simpler solution. Sticky Password Team To Jeanne Esther: The Sticky Password FREE is currently a limited Sticky Password product which can be used without any license. It allows to use actively 15 accounts and 1 Identity and has no sync feature. Other features are the same. You have also an option to export the data in various file formats including the database format of Sticky Password 6 PWS. You don´t have to do anything else. The Sticky Password 7 Desktop version has the same installer like to online one. The only difference is in the license that allows you to sync your data. Thank you also for your opinion regrading our license system. We will discuss it in our team and we already prepare some improvements which will be introduced soon. Jeanne Esther Thanks for the clarification and taking my feedback into consideration. Since I have the option to export the data for import in version 6, then I think I will give it a try. Keep up the good work and hope you come up with a much better solution. Do I understand correctly that regardless of the (at that time) current version Number, the Current version will export to previous Version format for YOUR products??? Adrian Poore I was going to go for this as I had been waiting a long time for it to appear. However having my passwords stored in a server some where in cyberspace and also on the cloud is a big no no ..... military grade encryption ..... hello wake up and smell the coffee...... military grade gets hacked often enough just look around the web..... Finally the big one. I will pay once for a program providing it is good. This thing about yearly subscriptions is a con. just a way to get more money out of the punter. Then again I suppose you wouldn't like my custom anyway after this.!!! Cary Adams I don't mean any disrespect to the developer here... but all this encryption stuff is just words to most of us... First, we have to take your word that what goes to the cloud is encrypted, and encrypted properly. Second we have to believe that the encryption keys used for encryption can in no way pass to you. We also must assume that the encryption is properly implemented. And then there is the whole issue of cloud security and the impenetrability of AES at stake.With all that said, this app contains the keys to not just Facebook, but our email networks, our financial accounts... and you are asking us to entrust that entire process to you... a stranger to most of us. No guarantees of security (as if that is even possible), just "trust me" The cloud is dead for secure storage. While I may backup my video/audio collections there, I'm not backing up my life in the cloud any more than I am forced to do. Look, I operate a cloud accessible server in my home. Would you entrust me to encrypt YOUR personal matters and store those on my server? This is one of the best password apps, but forcing me to go to the cloud is a deal-killer. Larry W Can you tell me about the Premium Lifetime License for $24.99. I looked on your website and only found the comparison for "Free vs Premium". I've owned previous versions of Sticky, but stopped using it on the version that went to subscription based service for cloud. -Does the free offer of Premium for Windows only cover the desktop version or does it allow for cloud syncing to devices and other computers? -Would there still be a subscription fee to use the cloud? -Is this a lifetime update license for the software? In other words, does it include major upgrades (v9, v10, etc), or just allow you to use v8 for it's lifetime. -How long will this deal be good for. I want to try out the free Premium for a while before deciding to change my current password manager and purchase the lifetime license. I want to make sure this works as well with financial accounts and others that I use for multi-passwords. jordan cooper Too bad that I can't use this excellent software due to the fact that I use Slimjet as browser. By the way I would like the developers to think about adding support for some "minor" browsers, at least the most used. Phil Share Does that mean that all the rest of Sticky Password Premium features other than cloud sync will continue to work after a year? After a year you will be switched to Sticky Password Free with no sync and no priority support. Other features will still work. Phil Share Thanks for the quick response. Is there a limit to the number of accounts in the free version? Sticky Password Team Phil, there is no limit to the number of accounts even in the free version! b g So, in plain language, the "free" reference is for an extended TRIAL of the full featured program but with the added feature that it reverts to cripplwware if you don't pay up. Do I correctly understand the offer? Alan User I'm confused--Sticky Password is listed as available for Mac & PC, but when I downloaded the free version, it was downloaded as an .exe file. How do I obtain the file for the Mac? The free version is fully functional password manager. In premium version (today´s giveaway) you can also sync your data via cloud or local wi-fi across all your devices and you have access to priority support. If you are ok to use Sticky Password only on one device then free version is fine for you. If you want to use more devices, then you will need premium version to sync your data. Cary Adams So Sticky Password Free is no longer limited to the number of records it will store? At least that seems to be what the comparison page shows. If I understand the table correctly, the only difference between free and premium is the sync capability (and of course the manatees). Is that correct? Otherwise the free version is not limited in any way? ben User where are the passwords stored? on the cloud? on the user's local machine/pc? are the stored passwords encrypted? basic info that should be in the description. Doh! Lionel User I just downloaded the program but cannot register it: "9103 network error:12029" . Impossible to test you software like this. The password database is stored locally on your computer. You have an option to select if you would like to use the sync feature. If you use the sync feature, the backup of the database is then stored in the cloud. Or you can use the local sync using your wi-fi. They´ll help you to fix the error. TURGAY KALA I can download Windows version but on my mail Mac&PC. I'm using Mac. Can i have the Mac download link ? You should receive the serial (license key) in email from BitsDuJour. It´s in the part of the email called "Registration Information". 1. If I purchase the Sticky Password Premium Lifetime License, is this the top-of-the-line version? 2. Does Premium Lifetime include full cloud syncing across all devices? I have 3 Windows computers, an Android phone, and an iPod touch (WiFi). 3. I have another password app, which I can export as CSV or Excel. Will I be able to import this into Sticky? 1. Yes, that´s top-of the-line version. 3. Sticky Password supports import from Roboform, KeePass, LastPass, Dashlane and Kaspersky Password Manager. If you use other password manager, you can give it a try but we can´t promise it will import correctly. Lionel User Will an Android device "read" this type of file. Have you made stickyppass in an android compatible format on google store? Raleigh User I downloaded this software and installed it. But when I click on the desktop icon, nothing happens. I uninstalled and tried again, same results. I tried downloading again, but was refused because only 1 download is allowed. Any suggestions? I am running Win 8.1. Constantin Florea @Raleigh User, I've just sent you an email regarding the issue you mention. Raleigh User I received your e-mail. I clicked on the link and the program downloaded. But when I try to open the program, I am asked what program I want to use to open it. I have tried internet explorer and, bonjour service, but it does not open The file I received is stpass_80049_bitsdujour. It is not an executable file. Please advise. Free Ride Unlimited logins that can be saved now in the Free version are a nice change compared to previous versions but if i'm not really interested in Cloud or Sync, i will be forced to create a StickyID and test Premium for 30 days, it's not really userfriendly to offer no choice or options regarding that for a user. If i don't want to create a StickyID or test Premium, i'm not able to use the Desktop version or the program as local password manager. Is that correct? Yes, there´s need to create StickyAccount. You will not be able to start using Sticky Password Premium or Sticky Password Free without it. You can choose no sync during the installation and start using Sticky Password as you know from our previous Desktop version. There will still be 30-day period while you can test features of paid version. Here you have paid features for free for 1-year. Only thing you need to do is create your Sticky Account to start using Sticky Password. cloud=sync. when u turn on sync u get cloud. when u turn off sync u get local. the choice is ur's, ur not forced to use the cloud/sync. Sticky Password Team To Free Ride: Well you can choose to stay offline if you want. Sync is optional as well as storing the database in the cloud. Yes, StickyID is necessary because we handle licensing through this, but it during the installation you choose the synchronization option - Cloud or Offline. So it is a little bit different from the previous version, but the functionality stays. Desktop version is "inside" the new Premium one. Drive Stark Naked I see you are now offering a lifetime license for $30. Do your lifetime licenses include future major version changes? Yes, lifetime license includes all future minor and major version changes. Lifetime license is a license that will never expire, with lifetime license you don' t need to pay for subscription every year. BDrJ I bought here on this website, in 2015, the "lifetime license"! The most useful software. I use it 30 times a day, every day ... It is a marvel - and the "dream team" (Lamantine of course) is outstanding, very competent. This is my most valuable purchase in recent years - without hesitation! I'm just a customer. I want to clarify it. Nico Westerdale Great News! Sticky Password has agreed to extend this deal for another day - Enjoy! Brad Great Deal, just purchased the Lifetime offer. I have been on the hunt for a new password manager and had recently decided to settle on Sticky Password after looking at several other options. I'm a disillusioned LastPass Premium user. LastPass was recently acquired by LogMeIn, IMO an unfortunate albeit regrettable decision by LastPass. A vocal group of current LastPass Premium users in the LastPass forums are in process of jumping ship from LastPass due to the LogMeIn deal. Many are looking for alternatives. Sticky Passwords name comes up frequently in the LastPass thread dealing with the LogMeIn purchase. It is why I opted to try your company out. I was not disappointed that I did. Expect more customers Sticky Password, coming from LastPass. What I really like with Sticky Password is their offering a Lifetime option. As an example, another password manager Dashline while it does have a nice functional interface and feature set it is also $39.95 per year. By purchasing the Lifetime offer here at BitsDuJour I enjoy a 70% discount, or $30. But it is not just the great value financially. I also really like the fact that Sticky Password has a portable USB version. But what sealed the deal for me is the option of syncing through my WI-FI only! !, verses syncing everything to the cloud. Yes, I know it is encrypted "six ways from Sunday", but I am getting more leery of placing such critical password information in the cloud. But this is more likely just my paranoia. Jack User I now use Roboform. Is it possible to somehow transfer those siite logins to your service? I have hundreds there. Is there a maximum number of logins for your service? mr User @ Jack User: I used the built in import function to import well over 100 logins and safe notes, quite well described in the help sections, albeit a bit convoluted. Both Sticky password and Roboform have their strengths and weaknesses. If cost was no concern I would go with Roboform, but the difference isn't that big otherwise. There´s no maximum number of logins stored in Sticky Password. John User Does this work with Microsoft Edge? I used Sticky Password for several years, but then started having problems with it not integrating well with browsers. Often it just would not work forcing me to look up passwords. I switched to Dashlane and for the past two years was happy, but now it will not work with Microsoft Edge because of the extensions. Sticky Password does not support Edge. Microsoft Edge does not support extensions yet. We support more browsers than any other password manager but we can´t support Edge without these extensions. Vic Rosa Once again, i didn't receive the email with the key. Can you tell us if you bought a lifetime license or choose the yearly license for free? If you haven't receive the free license, please try it again at BitsDuJour. Also check your spam folder in the email client. HS User Can i use a Lifetime License on multtiple computers? Roger User Hello, wondering if Sticky Password can be used to fill passwords to websites on a ChromeBook running ChromeOS? Vic Rosa I Choose the early license for free, but so far i have not received the email. Yes, both yearly and lifetime license covers all your devices, it's per user and not per device. You can use it on as many devices as you need. We will contact BitsDuJour to solve this. Brenda Gann What happens to your passwords after the year is up? Can you still log into the websites or does the database lock up and you can't see any of your passwords anymore? What about getting on your websites on a pc and tablet? Martin So it's lifetime or for 1 year ? On the top it says: "Sticky Password Premium - 1 User Lifetime License v8.0.6.145"
And on the bottom: "Sticky Password Premium for Windows - 1 User 1 Year License v8.0.6.145 (0€)"
Constantin Florea @Martin, The "Sticky Password Premium for Windows - 1 User 1 Year License v8.0.6.145 (0€)" item is offered during the giveaway and it is subscription based meaning that after 12 months you would have to renew your subscription in order to keep using the product. The "Sticky Password Premium - 1 User Lifetime License v8.0.6.145" item is offered as an up-sell (during this giveaway) and it offers lifetime usage of the product. Lois McCabe This does not work with Mozilla Firefox 64-bit Ver 44. Firefox requires "signature" from Sticky to run the auto-fill plug-in. I thought I would switch back to a FireFox 32-bit, but my understanding that all versions of Firefox will soon require this "signature" from Sticky. Too bad, as I have a paid version of Sticky and I really like it..
Sticky Password Team @Lois McCabe, At this time we support only 32bit version of Firefox where our extension has been of course signed by Mozilla. We plan to add also support for 64bit version soon, approximately in March. Thank you for understanding. Joe McCormick Lois. I was running FireFox 32 bit 43. I bought a lifetime license to Sticky Pass a few days ago. It has been running well. In fact I liked it so much, I have stopped using LastPass which has been my password manager for the past 2 years. FireFox has now updated to version 44. Sticky Pass is working just fine. To me, it seems to log in faster then LastPass. barney User I'm a bit confused. "All your devices" is the claim, but my phone, for instance, is Android based, as is a tablet, and I have a couple of machines running various flavours of Linux. However, everything I've seen suggests a Windows-only environment. Please clarify. Sticky Password Team @barney User, One license covers all your Windows, Mac, Android and iOS devices. We do not support Linux. Jude Gautreaux I understand This is a one year license. My question is after one year can I still use it locally on just the computer I install it on or does it quit working altogether. John User I have been using Sticky Password off and on for years. I took a break from it in favor of Dashlane, but went back to Sticky after purchasing a lifetime license here a few months ago. Honestly, like Dashlane, I find it mostly hit or miss - in the case of Sticky it DOES hit more than it misses. However, having said that, there are times it just doesn't do what it is supposed to do. For example, you enter all the necessary date for a web account, say eBay - the web address, your login information, the password, etc. You either go to the website or hit the "Launch" button in Sticky and it takes you there, but simply doesn't log you in. You have to look up the info yourself in Sticky and do a copy/paste. Again, this doesn't always fail like this, but enough to be somewhat annoying. I installed the sticky app for my Android LG phone and my iPad 2. I'm sorry, but I just cannot figure out how to get it to work. While it does synch very well with my PC and gives me a database of my login info, I have to manually look it up again (as above) and enter everything. One feature missing in Sticky that I liked in Dashlane is the ability to copy/paste in Android/iOS. Another complaint on all the password managers is that they do not work with Edge. No fault of theirs due to the extension matter, but if you must use Edge, forget about having any password manager. I don't want to come across as negative, as I am very positive of Sticky Password. IMO you will not find better support on any software product. However, if you need to accept the limitations and occasional hiccup with any of these password managers. Still, based on my experience Sticky is the best of those out there right now. d adams Can I import my passwords from Lastpass? John User Not sure about Lastpass, but I had to manually import all my passwords from Dashlane to Sticky Password. Sticky Password Team @Jude Gautreaux, Yes, you can still use it locally. After one year you can either subscribe for another year or you will be switched to Sticky Passsword Free. Sticky Password Team @Jon User - Sticky Password does work with Windows 10, x64. Edge browser is not supported because this browser does not support extensions yet. We'll waiting for Microsoft to enable extensions for Edge. Peter Thompson I recommend this to anyone. Got the premium lifetime deal last time BitsDujour had it on offer and have used it generally daily ever since. It's a lot better than LastPass (LastPass doesn't have a lifetime license for example). Support is always quick to. Barry User been using the lifetime promotion for a 1/2 year now or little more.. and i love it!! Perfect program, even app for my android, but use it main on my desktop! Ideal to only remember 1 password, and he auto gives me the logins needed when on a page i want to enter. Go Buy it! Worth the money! tm junk does the lifetime support includes version upgrades from current 8 to 9 or 10 for lifetime span ? John Hood 1. Can I use the $0.00 for a bit today and come back later today to buy the Lifetime if I like the program. 2. I attempted to use my old account login - it was accepted. It will not take what I thought was my password. Usually sites permit us to get an email to use a link to change the password if we give our correct login but forgot the password. You don't offer to send an email to help us change our password - I need a link. A User registration information is empty in the BitsDuJour Software Receipt Email. Does it require one or is it a special version? John User I have been a lifetime license user of Sticky Password for a few years having switched from Dashlane. I couldn't be happier with the way it syncs with my computer and mobile devices. Also, the customer support is among the best in the business. One question I have been asking and I will bring it up again. With MS Edge now allowing extensions what is the status of Sticky Password integrating with Edge? Thank you. Constantin Florea @Jean User, I transferred your purchases to the correct account. Please log out of all your machines where you may be logged in and login again using the correct BitsDuJour account to ensure that going forward you will receive the receipt email to the correct account. Lifetime license covers all minor and major (version 9,10 etc.) updates. You should receive an email with download links and license key from BitsDuJour. If you don't have it, please contact BitsDuJour. Unfortunately there still is no easy way for developers to provide stable extensions for Edge in a standard way. We will be able to work on it once Microsoft releases stable version of Edge with full extension support. Nelson User I got it working make sure all browsers are closed i thought chrome was closed but it was minimize. If this happens to you uninstall and reinstall double check that all browsers are closed had a duh moment lol. John Hood I decided I want to buy into the lifetime license at the $44.99 price - give me the link to do that please with instructions as to overwriting the free version or whatever. Using Windows 7 x64bit. Que La @A User, I have re-sent your receipt email, check your inbox and spam folder and you should have it shortly. Peter User Does The lifetime license also includes lifetime free upgrades? Can you use your own password? I have a different password for every website. I use a formula based on the website and I have been using that for years. One license can be used on all my devices right? Lifetime license includes all minor and major upgrades. You can use your own passwords or use the built-in password generator to create strong and secure passwords. Yes, one license covers all your devices. Sticky Password automatically catches new passwords at new websites. Nelson Carvalho I suggest buying the Lifetime License. I bought this license a few years ago and I do not regret it. Sticky Password Premium for Windows is excellent software. Andreas Moeller There is no license key in my email. Field is blank. bricolou there is no license key in the mail...is it correct ? made it twice...same thing. Nelson User Does the lifetime license transfer if you buy a new PC or Mac? Rheal Poirier I received the email that should contain the licence key, but the windows that should show said key ise empty....a kind of bug in your system. By the way i have my home computer plus a laptop...So if i do well understand the offer the program could be installed on both devices without any supplement fees. Do am i right ? Rheal Poirier i did for a second attempt ask to resend me the licence key, but the window where it should show the licence key, still remaining empty. Just reporting this bug of your system. Ekaur Mhril No keys in the mail . Just a blank box below . How to proceed ? Howard Silver If I download Sticky Password to my Mac, what happens when I try to log onto a site using my PC? You can install Sticky Password on all your devices, the license covers them all. Please contact me at marek.vagner@stickypassword.com and I'll provide you the key. You can use Sticky Password on all your devices. With Premium version, the data are synced and you have access to them on your PC, Mac, phone or tablet. Constantin Florea We have resent the receipt emails with the registration codes to all of you requesting it above. We are watching this comment section carefully and will resend the receipt email for new requests as well. I've already got this offer from another website and I like your software. I set the custom scaling level at 150% (in Control Panel\Appearance and Personalisation\Display), but in the new Windows 10 control panel - settings, system, display - it shows as 175%. My monitor is a Samsung SyncMaster SA100 - LS22A100NS-EN. Dee This is critical. Can I export my database contents to a backup spreadsheet which I can lock away for safekeeping and, one day, for my executor? Stephen Warkentien If I let Sticky Password generate my password, then how can I log in from a public computer? geo User @ BDJ My receipt has no license code (all blank, just yellow rectangle). Re send did not seem to work so far. Can BDJ look at issue. Other option is to check your passwords in our mobile app (Android or iOS). yabatopia I've purchased Sticky Password (2 lifetime licenses) on a previous deal and I'm happy with it. I especially like the local syncing via WiFi feature, meaning that I don't have to worry about storing all my passwords in the cloud. I also have premium LastPass account, and while Sticky Passwords is not as slick as LastPass on mobile, it's hard to beat the value of a lifetime license. Is it possible to import all my password from Lastpass? I can export to cvs from lastpass but is Sticky able to import that? Peter Thompson I rarely visit or comment on Bitsdujour these days but just thought I'd come on and recommend people get the lifetime license. I used to use LastPass but needed a password manager that would work on all my devices and didn't fancy having to pay a regular fee. The lifetime license was very cheap and it really is a lifetime license - support, updates etc. forever. I rarely by software but for a one off fee it's worth it. Jean-Francois Puglia Hi, Lastpass can enter your password and username in apps on Android. Can sticky does this too? I try it and can't seems to find how or if it can. Portable USB version of Sticky Password does not leave any data on the host computer after the USB is detached. Peter, what do you mean by "How secure is your password after USB is detached"? We added one year to your account manually in our system. Not sure why the key you received was not working, we apologize for that. Dennis User I'm having the same problem as many others -- I received my software receipt from Bits du Jour but there is no license key in the email, just a long yellow window with nothing at all printed in it. Que La @geo User, We re-sent your receipt email, please check your inbox and spam folder. Que La @Dennis User, We re-sent your receipt email, please check your inbox and spam folder. Dee PW manager KeyWallet 1.0.1 has served me well for 15 years, but it's not being maintained and it's time to move on. I want local, not cloud, storage and Sticky looks like a good alternative. But Is there any chance that it can import my several hundred PWs & URLs or will I have to manually type them all in? David Ward I was a firm believer in RoboForm for 12 years but they ran deals but for new users. I got a free year of Sticky Password. I used it a little but never switched. My subscription for Robo was coming up so I really tried Sticky. I LOVE IT..so much better than RoboForm. I bought a lifetime subscription for $30 and the latest update shows they are still working hard..Try the year but pay the lifetime and never look back. Benjamin User I had a 3 years subscription deal in a bundle. I like it. But the first program I used was 1Password for Mac. Then I bought it on Windows. The Windows version was not working well for me so I used many others programs: I tried Dashline, True Key, Sticky Password and LastPass. 1) True Key for it time saving face recognition for PC. If you use a Mac, use 1Password. 2) Sticky Password or 1Password for PC (Install 1Password on Opera as it's the only web browser on which 1password is working perfectly for me). 4) Dashlane : I was told it's the best alternative to 1password but they never sent me my 1 years free license so I couldn't use it properly. Plus I had some issue while using it that made me upset and give up. Sticky password is a nice program, but I sometimes am fed up with logging in several time a day because it shutted down suddently. The 29$ lifetime license seems to be a great offer. Just hope it's a true lifetime license not limited to 30 years and that you will have access to every major upgrade... Let's wait and see, but I am very interested in this lifetime offer at this great price. heini User No Registration Number in Mail !!!! Peter Blum Sorry, but i did not receive any licence code. I only get the possibility to buy an code. is this also for Windows Operating System? Paul L Email arrived ok but registration yellow box is just yellow...no registration info! BitsDuJour Software Receipt - Sticky Password Premium - 1 User 1 Year License v8.0.11.49 no registration information is available. Craig Haywood Installed the software, created an account and master password, confirmed master password and then get stuck on step 3 (synchronization) where it asks for the master password it says a problem with two factor authentication occurred. I then uninstalled the software, re-installed, went through the same process as before and got stuck at the exact same spot. BitsDuJour Software Receipt - Sticky Password Premium - 1 User 1 Year License v8.0.11.49 ist keine registration information vorhanden. We apologize for this and we contacted BitsDuJour to resolve this shortly. Please check your email, we just sent you an email with another license key. They will help you with the install process. Yes, one license covers all your devices (Windows, Mac, Android and iOS). Erwin Apao The same thing happens to me. No registration info in the yellow box. ..... is just yellow...no registration info ???? Erwin Apao I just received an email from Marek Vagner with the registration code. John User I'm facing the same issue with the missing license code in the email. Any suggestions? diane User no key in yellow box??? diane User no key in yellow box in email?? Nelson User I just registered for 1 year license but did not get registration key yellow box is blank please help thanks. As above no reg info so not much good to me after you said its fixed ????????? down no = BDJ-gpV6ng please rectify and FIX EMAIL INFO??? Toto @Sticky Password Team: Still no registration code in the email. OK, thanks, already bought a Sticky Password Lifetime license. free year of Sticky Password Premium. fistful I did not receive the key. Constantin Florea The receipt emails (containing the registration codes) have been resent to all customer mentioning the issue above. ?????? User Thank you key received. John User The key is received. Thank you. dino User Expeditious reply from Marek Vagner. Tip Ho I am using Firefox as my default web browser. It appears that Sticky Password not longer works in Firefox in its recent versions. Wild Wizard I also got the email and the code box in yellow is totally blank ??? How am I supposed to use the software ?? BitBucket @Benjamin User "Sticky password is a nice program, but I sometimes am fed up with logging in several time a day because it shutted down suddently. " Have you configured Autolock (timeout period) in the settings? Menu > settings > Security > Autolock. Benjamin User Big issue. I've bought the lifetime license, but I have been withdrawed twice! I did not allow two payment but one. Please refund me as soon as possible. Thanks for your comprehension. jack hath Is SP a web-based program or does it reside on the user's computer? jack hath The DEAL says Lifetime license but the website says 1-year. --- Which is it? Russ Martin The fine print says, "After you purchase Sticky Password Premium it may be used indefinitely". 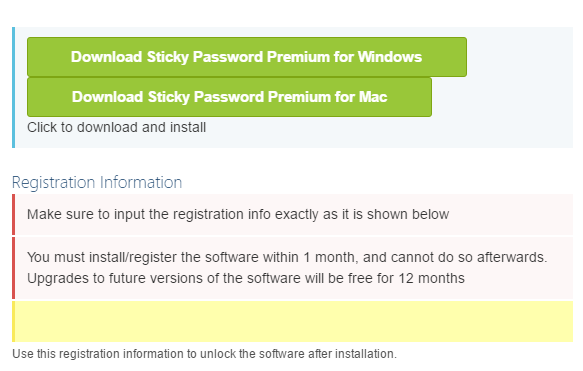 The purchase page says, "Sticky Password Premium - 1 User 1 Year License v8.0.11.49". Which is it, indefinitely or 1 year? Sticky Password supports Firefox. Have you installed Sticky Password extension for Firefox? Please open it in your Firefox browser and after the .xpi file is downloaded installation should start automatically. Other option is to open Firefox window and drag and drop the downloaded file. Please contact us at support@stickypassword.com from the email address that you used for the purchase. We'll then refund one of your orders. Sticky Password resides on the user's computer. There are currently 2 promotions on BitsDuJour. Yearly license is for free and lifetime license is offered with 80% discount. Dee Can it be used and synchronized with Firefox for Android? M User 1. The $29.99 "Lifetime License" promotion is good for the current version, or for ALL future updates and future versions? If for all future versions, I'd consider buying. 2. Is there a period during which we may uninstall and ask for a refund if the software does not meet our needs? Michael K I have been a long-term user of the Premium version and regard it as "must have" software! I changed from an industry leader that rewrote their software from the "ground up" and I found a security weakness I was not prepared to live with and changed to Sticky password as a result and have been very happy ever since, which is a good few years now. The service is excellent from the software and when I had the occasional questions the support service has been everything I could hope for. The software allows you to create secure Memos which is very useful. So useful in fact that I use it extensively and made some long memos. When I do a keyword search knowing the info I need is somewhere in the data I've put in, several memos may show up and as I click into each or even if it is only somewhere in only one memo, I would like my keyword or phrase I searched for to be highlighted as I scroll thorough looking for the information and it is not so it can be difficult to find particularly in a long secure memo. My work around has been to create shorter memos but that is not ideal so if the search data is highlighted it would really make life easier. . PLEASE Sticky team! This is a great offer for a great piece of software from a great developer! Thanks "Team Sticky" and thanks too to "Team Bits" for getting such a nice offer on the site! How can i import lastpass? What about PBKDF2 encruption method support ? 1- Sync methods : Cloud and Wi-Fi. Sync multiple devices with multiple desktop via private wifi. Let the choice in each secure notes. It’s better for security and usability to choose in notes if we want to sync with cloud, wifi or both. 2- Let windows to be resized, this is needed sometime for notes field. 8- Hierarchy navigation to better organize data. Like in Keepass, capability to better organize information by allowing to have sub folders so a navigation within a treeview (at least to have the option to). 10- Unlock browser extension unlocks desktop application and visa versa (when desktop app will be available). 12- Owncloud & webdav support. be great to sync to a NAS device like a Synology via WebDav for example. This way users can feel more at home / ease with security etc. 13- automatic web site icon import when we create a new entry. For already saved entries, we ask for edit and we have enough space on screen (while things are written in a small font) as there is not much to display. - not even resizable so for long note, it's clearly a problem. Will you change that ? please do so. And one other missing thing is a way to attach images and files for each entry, is it planned? Is it Sticky Password Premium - Lifetime License v8.0.11.49 for $29.99 ? Alexandre Emeriau How to delete all entries ? I need to do another lastpass import. Keyboard Cowboy I've been looking for a replacement for my two password programs, Password Depot, and Dashlane. I've purchased this program, installed it, and put 30+ passwords in it. I think it has tremendous potential.........but is not quite there yet. Here are some issues I find troubling. A) The browser support, while extensive, doesn't support one of the most popular browsers, WaterFox. This is a serious issue for me! B) I have not been able to find any way to add a browser manually. C) There is no way to add info to a "web account" (their way to describe an individual password file). For many passwords, I store additional information, besides a simple password, such as accou8nt info, addresses, etc. Sticky Password has a Secure Memos option, but that means the data is separated from the password and is cumbersome. D) While it supports many options, it seems to ignore the system default browser (probably because it doesn't support the one I use) and then it defaults to the Microsoft browser. I'd like to see a drop-down menu that allows me to pick one of the approved browsers. E) I'd really like to see a "top bar" incorporated with the ability to drag and drop Login info when the auto fill doesn't work. F) Autofill doesn't work on all sites..............see above. G) I'd like to see the ability to change the font size permanently in the program. On large screens, the text is pretty small. I offer these comments not to criticize, but to point out areas/opportunities for improvements. I like the product so far.....it just needs more development in my opinion before I'd call it a class-leading password software. They will help to answer all your questions. Alexandre, regular pricing is $29.99 for yearly license and $149.99 for lifetime license. And we had a promo at BitsduJour with yearly license for free and lifetime license was offered with 80% off to $29.99! At this time Sticky Password uses the following symmetric encryption algorithm: AES. A block-cipher symmetric algorithm with a key length of 256 bits. This algorithm guarantees a high level of security and is one of the most commonly used. Yubikey support is not in our nearest plans however we may add it in future updates. 1) We offer both cloud and local wifi sync. However it´s not possible to select specific sync method for selected items from your database. Whole database has to be synced at once. 2) Sticky Password windows can be maximized and resized. 5) Master Password unlocks the database on your device. It´s currently required only when unlocking the app. 6) Database is merged during sync process. 7) Please specify this question to our support. 8) Sticky Password allows to organize accounts in groups and sub groups. 10) Sticky Password offers this feature. 13) Sticky Password offers this feature. Account comments are displayed also in the extension menu in the browser. Adding of files or photos isn´t currently supported. We will probably add this feature in future updates. A) Unfortunately at this time we don´t support Waterfox browser. It´s possible that we will add support for this browser in the future. C) Each account offers a Comment field available directly in the Edit account dialog. D) If the default browser is supported, Sticky Password opens accounts in the default browser. F) Please report problematic websites to our support including the URL and info about used operating system and browser. Our team will check it and fix the issue if possible. We all the time keep improving our autofill engine. G) This feature is already in our plans. I tried to do as you suggested.....I have not been able to find that option. The pull-down menu next to launch for a web account doesn't have it, nor does the pull-down menu for "edit" screen. Can you show me how this works? Keyboard Cowboy When do you anticipate that you might add WaterFox? They have a huge following, and it should be easy to clone the code for FireFox as WaterFox is based on the Mozilla engine. I fear I have not communicated well and as a result, your response isn't germane...........I acknowledge that my default browser is not one on your "approved" list. Since my default browser is not compatible with SP but is my default browser, your software launches Microsoft's browser, rather then another browser I have that you do approve of. As example, I have MS Explorer, FireFox, and WaterFox. WaterFox is my default browser. When I installed SP in all my browsers....."launch" would launch MS Explorer (since WaterFox is not approved). I suggested that if the MS system default browser, WaterFox in this example, is NOT approved, that you have a menu where I can pick which approved browser gets launched. I do not like MS Explorer, I'd opt for FireFox rather than MSE. The way I got it to work was to uninstall SP from all browsers but FireFox..........then it launched FireFox even though it is not the default browser. Hope this all makes sense. rojo @nigel Edge is a browser? I thought its only purpose was for downloading Firefox or Chrome. Huh. Anyway, I bought a lifetime license for Sticky Password several months ago. Aside from the Android client being a little cumbersome with generating passwords and Firefox integration, I have no major complaints. It was a worthwhile purchase. Database sync works flawlessly across all my devices among Win 7 and 10, Android, and iOS, and it stores my passwords for more than just websites. If you ever find yourself dabbling in smart home integration, managing a bunch of disjointed 3rd party apps each with its own password, you'll quickly gain appreciation for a worthwhile password manager beyond the sync mechanisms integrated into your web browser. And with each update, Sticky Passwords Premium has gained incremental but noticeable improvements. I get the impression that the devs are driven to perfect their product and service. This service is quality, not just a minimum effort money grab. This info should encourage more users to get the deal. No doubt the lack of support for XP is deliberately caused by MS designing their installer software to NOT work in XP. Does your program have a portable version (thus no MS installer required), which may work in XP ? Petronius Arbiter II Doesn't work on Windows XP? Sorry, that's a deal-breaker for me. rojo Jeez. Yeah, it doesn't work in Windows 3.1 either. You guys still obstinately running XP should have your machines air gapped for the rest of our benefit. XP reached its end of life over 4 years ago. Any vulnerabilities discovered since then have been and will remain unpatched. Running an XP computer attached to the Internet is like sending your kid to kindergarten without vaccinations, or possibly like letting your kid lick the chairs in a hospital ER. Y'all are probably unwitting nodes in a CnC botnet by now, infected with a well-camouflaged rootkit. At some point you've got to accept that you've gotten your money's worth out of your ancient beige tower, but now it's time for a more modern, more reasonably secure computer. This is not for your sake, but for the rest of us subjected to the fallout from your embarrassingly ancient insecure nodes. At the very least, consider replacing XP with Debian XFCE or some other lightweight Linux distro. "The Master Password you entered is incorrect. Please try again." Several times I've tried copy and paste and typing in the key but, neither work. mix624 Question, What happens if I have more than one email address and login with the same email provider ? Hotmail allows 7 email accounts and I have 7. How will sticky password log me in to the email inbox I want it to ? Peter User I try to switch from 1Password to any other password manager. So I tried Sticky Password. I appreciate lifetime subscription (1Password has only subscription, I use older standalone) i bought and possibility more passwords for one web page. However so far import from 1Password is a bit poor. So I will wait for other improvements. If si were you, look at categories 1Password offer and improve import. I will keep Sticky password and look forward for new versions. John User I hate to sound like a shill for Sticky Password, but every time it shows up here I have something new to say about my experience with the software and/or their customer support. For some reason Sticky stopped working with Opera 64 bit suddenly. This caused me some trouble as I have used that version of the browser for years and Sticky worked great with it. All my passwords, logins, etc were set up to work with it. I contacted Opera support about using the 32 bit version and keeping my settings, but they were not very helpful. I decided to go back to Chrome which I used in the past after discussing all this with Sticky's support staff. But then after a few days the support staff came up with a fix and now my Opera 64 bit is working fine again with Sticky! So you not only get a great password manager when you buy a lifetime license, but you also get their lifetime customer support which is the best I have seen. My thanks to them (especially Vaclav) for their excellent and timely support over the years. George Mihailoff Can you chose your own password for a specific site instead of the random generated one? Yes, you can choose any password you want for a specific site and Sticky Password will remember it for you. Anyway for increased security we recommend complicated passwords for all your accounts and password generator is here to help with their creation. mix624 You should really add text snippet autofill so we can add paragraphs of text we use over and over in emails etc...just using abbreviations. You would take some of the customers from phrase expander and phrase express easily ! I mean, they are highly sophisticated softwares for doctors etc, but for me it is to expensive and they take renewal/maintenance fees like $80 per year ! Eeeh...by the way..do you also have renewal fees if I get the lifetime license ? I was actually on the way to buy one of those updates but just got tired of the hefty price so dont care anylonger. They have about 6 hours to answer, which is when the lifetime deal is off. I hope sticky password allows me to use my old passwords or will it generate new ones automatically that I have to use ? How about printing out all of my passwords ? I would need to have emergency offline copies of my passwords in case something happen. One of the most amazing things about your comment is the big concern that XP users could be causing you grief at some point down the line, and possibly due to CnC Botnets. Most interesting that you mention CnC Botnet nodes, because the last serious threat I helped diagnose and remove from a computer was a CnC Botnet node. They are a serious nuisance, but back to your concern. So in short, by having a concern, you are stating that you do not have a protected system, and you want to blame XP users as if they could be the cause of your future infections. It is up to you to protect your own system regardless of what other users do, and you have no idea whether the user you attacked could ever be a threat. I take it then, that you are attacking any and all XP users. Regardless, you need to protect your own system, and not blame others if you get infected. You surely need good protection if you are running Windows, especially any later than XP. Your attack on XP users still doesn't make sense. Would you have made the same statement if the user had stated they used Vista? or Windows 7? Those operating systems are also no longer supported by Microsoft. You don't attack those users do you? That is a very large group, even though their OS has an end of support date in the past. Somehow you think they could not get infected by a Botnet. Think again. Botnets are most popular on Windows Vista and 7. Windows 7 has been the most successful OS since XP. In 2011, Microsoft reported that Windows 7 was less prone to infections than XP was. Before you get excited, keep that point in mind for just a few more points. Right off the bat, your comment is intentionally harsh with the Window 3.1 statement. There is a big difference between software developed for the XP OS and those developed for Windows 3.1. It doesn't run on the Apple II computer either. Windows programs developed in the XP era can still run on later Operating Systems (at least to Windows 10), so let's just strike that comment out. The XP user's question was not out of line in the least. In fact, it wasn't that long ago that Sticky Password did work for XP, and it was still part of the major version 8 series (current series). Version 8.0.9 supported XP; I know that at least starting with version 8.0.11.45, it did not (supported Vista and later). Since Vista has reached its end of support, why not take a stab at some of them too? What if the user you attacked instead had mentioned they use Debian, would you have attacked the same way? Probably not. If the user had said, "I love my Debian operating system, can Sticky Password work on that?" Your response might have been a little softer, agreeing with their use of Debian, but informing the user that native Windows programs do not work on Debian without running something like Wine. But running Wine on Linux is not a cure-all for every Windows program; I know. I have lots that do not work with Wine. But what if the user did not state that it was version 7 of Debian they were using? Would you have responded the same way? Because, yep, Debian 7 is considered outdated and no longer supported. Outdated as each new version comes along, and a year after each new Debian release, they are no longer supported. Gone by the wayside. Debian is on 9 now, and on its way to 10, so more are on their way out down the road. Will you attack those users because no more patches for their OS? Obviously your attack was entirely directed to XP users, as if they are the supposedly the biggest threat to the future. You are wrong. We do not know what you use a computer for, or what the XP user you attacked uses their computer for. If it is for checking e-mail and browsing the web, then sure Linux can do that job just fine. The XP user's computer may not be connected to Internet at all. They way the user asked does not imply that it is their only OS even, only that "my XP PC" is the one that they have an interest to use Sticky Password. You attacked without knowing the situation. I think and hope the portable one works out well for him. Without knowing the circumstances, why attack? The XP user might be referring to a computer used by the government or a military, and for those, Microsoft has agreed to keep those computers safe still, albeit for a price. The XP user might be referring to a (32-bit) Point of Sale system, and that has support from Microsoft until 2019, and here were are still in April 2018. Any user of 32-bit XP can run a very short registry change that makes their XP computer get all current updates, and some products (such as Cacheman) do it automatically. Speaking of April, Microsoft ended support for XP on April 8, 2014, and yes, that is more than 4 years ago, 20 days more. And guess what happened a month later in May 2014? Microsoft had to admit that Windows XP was getting fewer infections than Vista or Windows 7. It certainly didn't do much to convince XP users to switch obviously. Plus, the numbers are growing in favor of the XP users still. Mac users used to claim they don't need an anti-virus, because they could not get infected. You don't hear that so much now that their user base has increased from that 4.5% share. Linux, also benefits from the same small user base, plus how they generally download new programs (already vetted from Program Manager), unless they acquire them from 3rd party sources (PPA). The OSes still can have problems, but they have mostly been Flash and Java, not the OS itself. Number of users counts the most though. There are fewer and fewer XP users as times goes on leaving an even smaller group that are vulnerable to an attack. If not all, most of those same users generally have good anti-virus protection, firewalls, good backups, system images, and many years of experience knowing how to be prepared, and what to do should any problems develop. IBM does a great job of tracking viruses "in the wild." There aren't a lot of those that anti-virus companies have not developed a cure for, so it would have to be something new to take advantage of an XP vulnerability. Virus developers have a cost and value of return when developing for any vulnerability. To take advantage of any XP vulnerability, the value of return vs. cost is not worth the risk, compared to developing for a larger number of users, such as later Windows OSes. I use Linux, Windows 10, and Windows 7, and also Windows XP. My XPs are the most stable of all the other MS OSes. Most have the unofficial XP SP4 installed. I have 32-bit and 64-bit editions. By the license agreement, I have lots of software on XP that cannot be moved to a later OS. I plan to honor those license agreements. They work just fine on XP, and they are all running on very modern hardware that still supports XP. Doing batch operations, they take a great load off my other systems. So yes, I've got my money's worth out of my beige tower, but it was 486 machine. The later ones have all been in black, except one blue, and all but a couple are in racks, not towers. I don't worry about my XP systems nor my Windows 7 systems; I worry about the Windows 10 built-in protection that isn't fairing so well with outside testing. Per the AV-Test.org independent testing in 2016 reported by Tech Republic, "Microsoft's System Center Endpoint Protection fell in the fair-to-middling range, achieving an overall score of 14 out of a possible 18. By comparison, Bitdefender and Kaspersky Labs had the highest scores, both posting perfect 18s." I am sure it will get better for future editions of Windows 10. If anyone follows your suggestion to get away from XP, you are helping the XP users that do not make the switch. Thank you for making the XP users a smaller and smaller group. I recently helped a non-profit organization that depended on donated computers to allow users to have Internet access. All were running XP. They were all very well serviced, secured with Anti-virus and Firewall protection (software and hardware), and no one had been infected in over 9 years since they started. I know a senior citizen that has an XP computer. He cannot afford to switch, but his system is well protected. It is wrong to judge him as a purveyor of possible future Botnets. I know of another senior that has a "hand-me up" XP computer. His son keeps it in tip-top shape, and well protected. No incidents ever. Those users are non-technical, but they have technical people helping them out. Corporate businesses are also large users of XP. Some have the money, but they also have great protection, so why upgrade all their hardware just because it is possible? Please don't try to judge or bash people still using XP. They probably have good reasons to be doing so that you are not aware of. The protection of your own system is up to you; don't blame a group of users that you clearly do not understand. Since you are concerned about those remaining XP users, I think it is time to go boot up about a hundred XP systems, and have them all connected to the Internet, while they run some tests. Better shut your machine off. Oh, and by the way, the CnC Botnet was not removed from a Windows OS; it was the Linux.Rex.1 that targets Linux systems. I agree with you on one thing though, Sticky Password is a great tool. mix624 I will probably buy the lifetime license BUT...hotmail have 2 separate screen logins ! First the email address and then a new screen where I am supposed to enter my password. That didnt match with the ADD function. I couldnt make it work ? I will look into it more because I am sure you have a function so I can login at hotmail ! Robert Crombie Perhaps you should extend this offer for another day for the XP users. I just installed it into XP with (nearly) no problems. However after install completes, there is a wee wizard at the beginning that asks us to set our master password. If that is the only problem, surely your support could 'fix' that ? Jose L Santos I understand you had locked up this offer because of a predefined number of FREE licenses being reached. However, if I remember well, there was no notice of such a limit here before!. Not fair to your subscribers! ... but how, is the record is locked up!!!! Unlock the record for purchases of the Lifetime License, as this offer still had several days till expiration. Constantin Florea @Jose L Santos, The reason the offer got locked up is because we're going to run a giveaway for it in the next 2 weeks. During such giveaways we usually up-sell the Lifetime license. Leib Moscovitz I recently purchased a lifetime license for Sticky Password Premium on another site, and I am extremely pleased with it. The product itself, while perhaps not that well known (certainly in comparison to such products as Lastpass, Roboform, and Dashlane), works well and is pretty user-friendly. The support is also very good (at least judging from my personal experience). Bottom line: highly recommended (and I obviously have no connection with Sticky Password other than being a satisfied user). After downloading a version for Windows, I got a file with the extension dmg which turns out to be something for Apple Mac. Can I install this version also onto a Windows system? You should have a link to Windows version in the email from BitsDuJour. John User The best thing I can say about Sticky Password is that it just works. I tried others mentioned and was a Dashlane user for a couple of years. However, I ran into problems or features I didn't like. Their tech support was not good. I have had a few issues with Sticky Password, but their support for this software is outstanding. Another plus is the integration and synching from PC to iPhone to iPad to Android phone, etc. Constantin Florea @y x, Apologies about the issue with the download URLs being mixed up. This is entirely on me. Albert This is a great program. It's works and the best thing is that you can sync to other PCs and devices using the local network. No password database in the cloud (unless you want to). Get the lifetime offer. ms User This is a good program. I'm still using v6.0.18.485. The only problem is what happens when it changes to v9? Is the "lifetime" only good for the life of v8? The lifetime license covers all future minor and major (v9, v10 etc.) upgrades. FYI: If you have version 6 and you paid for it in the past, you might be eligible for free upgrade to lifetime license. Please contact our support at support@stickypassword.com and ask them if you're eligible to receive the free lifetime license. R W Appears to slow down pages loading where there is no password required. Please inform our support at support@stickypassword.com about your issues. We need to know your operating system, browser and an example of problematic website so we can take a look at it. R W It's all websites; Windows 10; IE11. All pages start to load then pause before loading the rest of the page. Killing the process solves the problem, so it must be the cause. OmnipodX Tried to get this yesterday and I still haven't received an e-mail (even after trying again later in the day and hitting the resend link on the second try). Constantin Florea @OmnipodX, I've just sent you an email regarding the issue you mention. David Ward I have a lifetime license. I used Roboform for over 10 years. Roboform is too expensive and Sticky is a much better product. Buy the lifetime license great value..I have one and bought one for my wife. The downside is it does not work on Chromebooks. I have not tried on a USB drive but is an option. Alan Blogski i have a Premium Lifetime License which i forgot when i bought it. im very pleased with Sticky password and this software is the very reason i will not renewing my license of Roboform. John User I have been using Sticky Password and singing its praises for years, but now I have to call out the developers out on a long time shortcoming - its incompatibility with MS Edge. For years we have received excuses as to why it could not be developed and development was coming, etc. However, now I see other popular password managers like Dashlane (the one I used before Sticky), Last Pass, and Robo Form to name a few are compatible with MS Edge. Although I will continue to use Sticky when I am using Chrome or Firefox at home, I have had difficulties at work which 'assigns' us MS Edge as our browser. How about an update as to when Sticky Password will be usable with MS Edge? Thank you. mix624 I got the lifetime version and it is so worth it and convenient. I never thought it would be this good. I had roboform earlier but hate them now since their lifetime wasnt lifetime when they asked for more money. Complete boycott of roboform from me. But updating this Sticky Password software I am a little worried about. Is it possible that I might lose all my passwords and details? I use the sync function so I think it is online too. I got an answer from support that made it sound like the only way to update was the manual way, or else there might be a risk of loss? I guess I have to contact them support again because I have had other update disasters. I know I am not supposed to print passwords out but is there a function for that if I want? Leib Moscovitz I bought a lifetime license for SP and am extremely happy with it - IMHO much better than LastPass and Dashlane, both of which I had tried before. No problem with updating - even if you don't use sync, the password file is saved offline on your computer, so it is readily accessible for import. As for Edge compatibility, it seems that you can already use SP on the new version of Edge, though not the one which is part of Windows 10; see the discussion of this on the SP forum: https://www.stickypasswor...3&t=107633. When Microsoft publishes more details about the new solution, our developers will immediately check options to integrate our extension. We're not sure why you're worried about updating Sticky Password. Please contact our support at support@stickypassword.com and explain them what you need to resolve. R W Installed Windows version, but when launched it asks for a Master Password. None was asked for, nor provided, during installation. Bruce Mittleman Can I transfer all my login passwords from roboform?